Having a good quality, comfortable rocking chair in the baby’s nursery is very important since you will be in there a lot taking care of the baby’s needs. A rocking chair enables the parent to feed the baby, read to them, rock them to sleep or soothe them or just sit and cuddle with them. We looked at the most popular styles and brands of glider rockers on the market and compared them for comfort, style, color choices, finish choices, size, extra features, and customer reviews from consumers who have purchased them and are using them in their own homes. The three glider rockers featured below are all great examples of good quality glider rockers that would be an excellent addition to your child’s nursery. Today’s rocking chairs are more often than not a popular piece of furniture called a glider rocker. They come with matching ottomans and have a smooth, gliding motion that is very calming for the baby. There are many different styles of glider rockers on the market for a new parent to choose from. With all of these choices, it’s easy to find one that matches the nursery theme you’ve chosen including the furniture finishes of the other pieces of furniture. With all of these choices available you may be overwhelmed when it comes to picking the right glider rocker for your needs. The purpose of this guide is to provide you with the information you need to sort through all of the different styles and choices and make an informed decision that will work for you for a long time. Purchasing a glider rocker is an investment and if you choose the right one that is of good quality, you can expect to have it for a long time. Stork Craft glider rocker is a beautiful piece of furniture for your child’s nursery that is super comfortable and functional as well. It has plenty of seating room, 2 convenient pockets to store belongings in and comfortable, padded arm cushions as well. The metal, enclosed ball bearings provide the user with a smooth, gliding motion that is perfect for helping the baby get to sleep and the parent to unwind and relax. The fabric used for this glider rocker can be spot cleaned so it keeps it like new appearance. The seat and back cushions are spot clean only, do not machine wash them. The matching ottoman provides a place for the parent to rest their feet which makes holding and feeding the baby even more comfortable. The neutral color of the fabric and beautiful dark finish of the frame easily blend in with most nursery décor. There are several different color combinations available to choose from including black and beige, cherry and beige and espresso and beige. 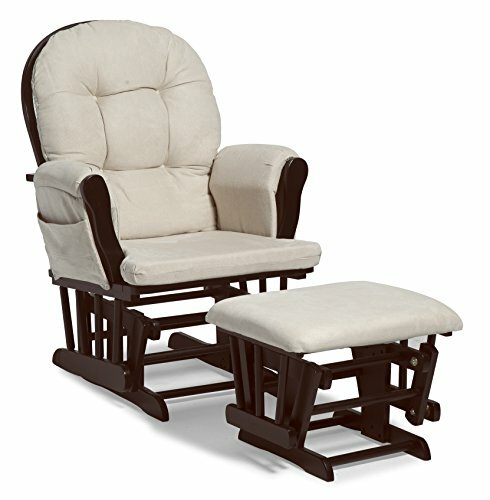 This comfortable, long lasting glider rocker comes with a 1 year limited warranty. Naomi Glider is the perfect glider with a matching ottoman for nursing the baby, rocking them to sleep and taking care of their needs, the padded arm rests make sitting in the chair and holding the baby comfortable. There are pockets on the side of the arms for keeping important essentials close by. Do not keep made up formula or thawed breast milk in the pockets as it can go bad. The cushions are made from polyester filled microfiber that is easily spot cleaned so it keeps its natural fabric. The ottoman has an additional slide out stool for nursing mothers to use when they are feeding their baby. The Naomi glider and ottoman set is available in many different finishes and color choices to choose from, so matching it to the nursery is not difficult at all. The bow shape of the back of the glider provides the parent with plenty of comfort when they are sitting in the chair. The sturdy construction will ensure that the glider rocker will last years, so you will have this chair long after the baby isn’t a baby anymore. Windsor is another great brand of these comfortable and stylish glider rockers. This attractive piece of furniture has a matching ottoman for the maximum amount of comfort while you are taking care of your baby’s needs. There is plenty of seating room along with comfortable, padded arms and convenient storage compartments that are easily accessible. The cushions are removable but spot cleaned only so your chair doesn’t become soiled and unusable. The white finish of this glider rocker and ottoman along with gray cushions works well in any room you choose to put it in. The ball bearings used in construction are fully enclosed and made of metal for super smooth motion. 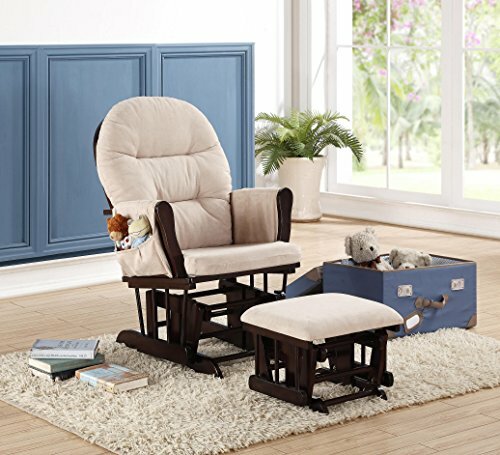 Parents and babies will love their time in the glider rocker. It is the perfect place to feed your baby and sooth them regardless of what time it is at night or during the day. Kick off your shoes, sit back and spend quality time with your baby taking care of their needs no matter what they are. Choosing the right glider rocker is important because this is a piece of furniture that you will have around for a long time. If you take the time to research and carefully choose the right chair for your needs and preferences, you will continue to be happy with your purchase even when the baby gets older. The three top rated glider rockers reviewed above are all high quality gliders that are put together with sturdy construction and care. All of them offer the user a few color and finish choices so you can choose one that will match what you want to do in the nursery. To learn more about the features available and things you should take into consideration when shopping, read the buyer’s guide below. It contains information you need to sort through all the different styles and brands so you can choose the one that makes you the happiest and that fits the needs you have. When you are shopping for a glider rocker, there are several things that you should take into consideration before you make your purchase. Taking the time now to research the different choices will ensure that you choose a chair that will fit all your needs and the baby’s needs too. This also means you won’t be wasting money on a chair you won’t like. We have provided some useful tips that you can use for picking the perfect glider rocker. Start looking early – if you are a soon to be new mother, make sure that you purchase the glider well before the baby comes. You will spend a lot of time in this glider after the baby comes, so making sure that you give yourself plenty of time to find exactly what you’re looking for is important. If you get the chair a few months before the baby comes, it gives you plenty of time to wear in the chair and be completely comfortable in it. What are your options? – Glider rockers are usually available in a variety of color choices, fabric choices and finishes. With all of these choices, you can choose a glider rocker that will match the décor of the nursery and the finish and color of the other pieces in the room. Research the Brand – Make sure that you know a little bit about the brand of the chair you are interested in. Looking up reviews on the chair is a good idea so you can see how people like the glider once they have purchased it. This can also give you an idea of any potential problems consumers are having with the glider, if any. There are several features a glider rocker can have. When you are looking at different models, keep in mind the different features that can come along with the chair as well. We have listed some of the major and most common features that you will encounter while you are shopping around. Comfort is Important – Head support, back support and arm support are all important when it comes to the design of your glider. Make sure that your feet reach the floor without strain and that the seat area is roomy enough for the size of your body. Wide Armrests that are Padded – Having comfortable and padded armrests is very important since you will be leaning on these armrests while you hold the baby. If the arm rests and thinly padded or not padded at all, you will find that it is not comfortable at all. If you’re going to use a nursing pillow, make sure there is plenty of room for the pillow to rest on the armrests and that they aren’t too high. Strong and Sturdy Frame – The frame of your glider rocker is also very important. You want to sit in a seat that is solid and that doesn’t feel flimsy. Make sure that there are no exposed parts that could pinch a child’s fingers or any gaps that could get an arm or leg trapped. Easily Cleaned – Babies spit up and drool and diapers leak all the time. It’s just part of having a new baby. You want to make sure that the upholstery of your glider rocker has scotch guard or some other kind of stain resistance on it so it can be cleaned easily. You don’t want to have a chair that is full of stains so finding one that has the right kind of stain resistant fabric will ensure that you can clean it as needed and keep it looking good as new. Locking Mechanism – This feature prevents the glider from rocking so you can stand up with a baby in your arms much easier. The locking mechanism also comes in handy when your child is older and can run the risk of sticking their fingers where they don’t belong. Swivel – The swivel feature enables the glider to not only rock forward and backwards but it can turn side to side as well. Many parents find the swivel feature very convenient so if you think you will too; look for models that offer this capability. Reclining Back – Some gliders have a reclining back that can allow the parent to lean back just a little while they are sitting in the chair. This is another feature that is a luxury and nit so much a necessity unless you know you will be sleeping in the chair. It is not safe for the baby to sleep in a glider since it is easy to relax your arms in your sleep and allow the baby to fall. Matching Ottoman – Most of the glider rockers available on the market come with matching ottomans, but not all of them, so make sure that the models you are looking at have the ottoman included unless this is not something you want. 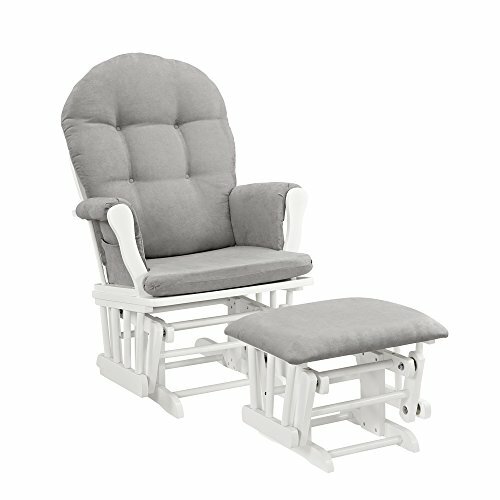 A glider rocker and matching ottoman is a wonderful thing to have in the nursery or living room when you bring home your new baby. They are so comfortable and soothing to the baby and make feeding time or cuddle time even more special to look forward to. With all of the fabric and finish choices available, it’s easy to find something that will match your décor and color scheme. When you are researching the different gliders on the market, make sure that you take your needs and preferences into consideration so you choose the chair that will be the perfect addition to your home and the baby’s room. Don’t look for the cheapest model. You don’t have to spend tons of money on a glider, they are usually very reasonable; but if you only look for the cheapest thing you can find, you will not have that chair for very long and will end up having to replace it. Take the time to research the brand, look at the construction and read customer reviews so you purchase a glider rocker that will last years and be a piece of furniture that you can have a long time.